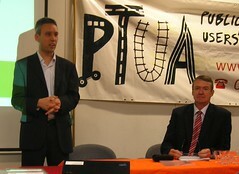 Last Thursday night Minister for Public Transport Terry Mulder attended a meeting of PTUA members. Mr Mulder’s address was followed by a lengthy question and answer session, covering issues such as Myki, bikes on trains, station facilities, Altona Loop timetables and the government’s planned Public Transport Development Authority. The Minister also discussed the new Melbourne tram prototype design, and revealed that it is planned to display the prototype at this year’s Royal Show. PTUA members who missed the meeting will find a summary of the meeting in the next newsletter.